Guitar worldmusic live on stage at Bürgerhaus Blomberg! Nylon meets steel - if you compare their string material only ! 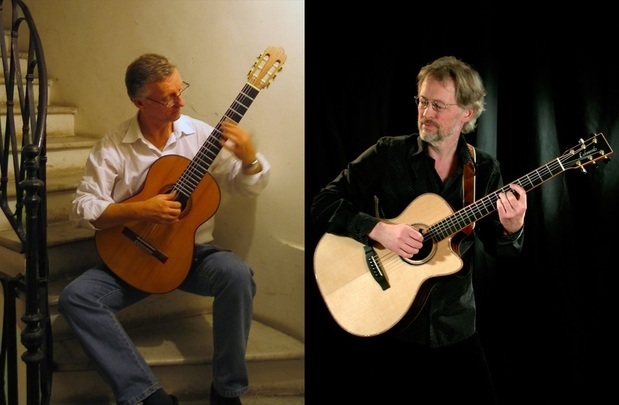 born in Bogota, Columbia and raised in Sweden the classical guitarist Per-Olov Kindgren today and daily is crossing the border between Sweden und Danmark. He is living near Helsingborg and is teaching his students Copenhagen. Peo is well known to many people being in touch with guitarmusic due to his performances on the videoplatform Youtube. On his channel operated with the username "andantelargo" he already has uploaded more than 250 videos and those attracted actually more than 27 million friends to have a look and a listen to. He is one of the most famous and know contemporary artists on classical guitar. Anyway he is not often seen on stage. In 2010 i.e. people could listen to his performance only once in the south of France. All the more we are very pleased that our virtual friendship for more than two years will be upgraded with personal acquaintance too. Welcome on stage in Blomberg, Per-Olov ! After receiving over 3 billion hits on his Youtube videos Ulli’s compositions and arrangements are played by many guitarists all over the world. His original “It Could Have Been” is on it’s way to become one of the most popular acoustic guitar songs ever. We are happy to have you here, Ulli !